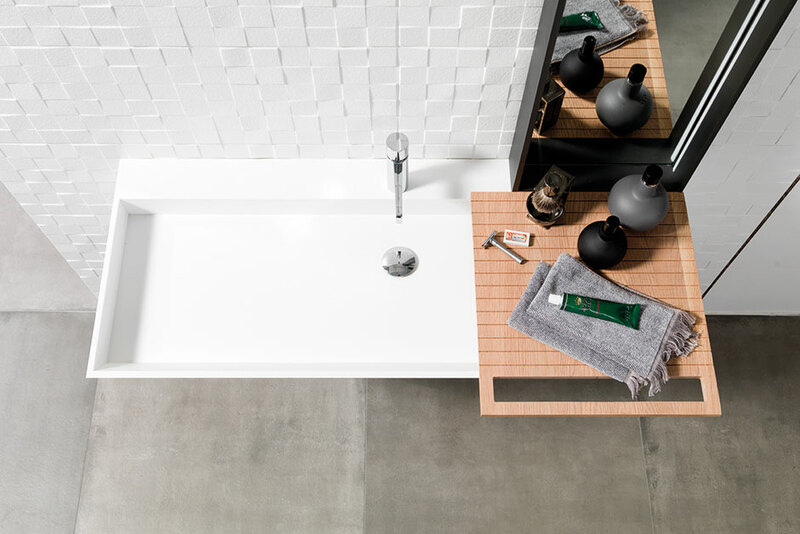 The new Bevel collection, designed by the Porcelanosa company Gamadecor, combines both minimalist and geometric design aesthetics together in order to represent a functional and elegant bathroom collection. 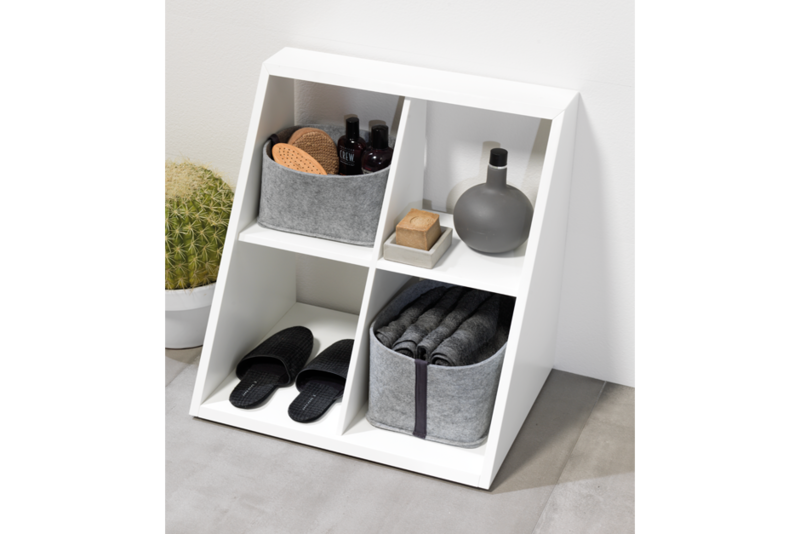 It is created out of the company’s KRION® Solid Surface material, which provides the furniture with high resistance to bacteria due to its minimum thickness and jointless design concept. 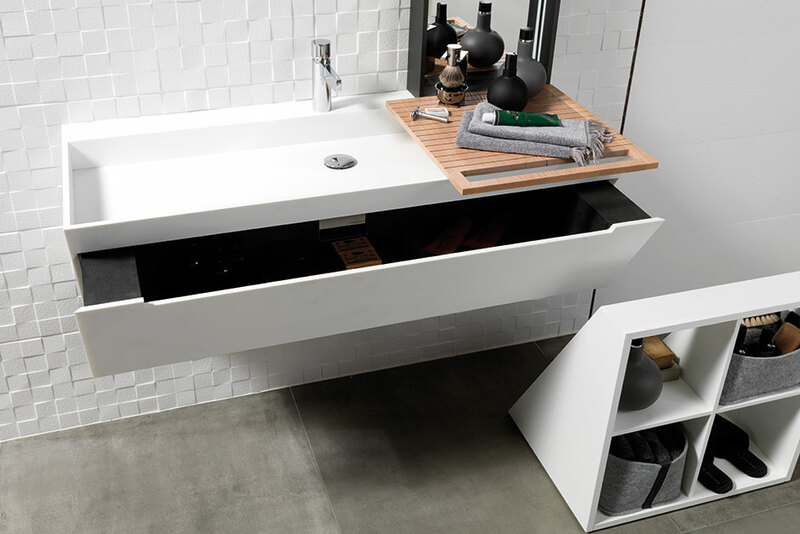 The Bevel vanity’s inward leaning front plane is a unique design feature that makes the vanity incredibly practical for everyday use due to its storage capacity. The vanity drawer sliders have been moved to the top part of the drawer, allowing the drawer to be completely removed from the vanity. The Bevel vanity’s handle, which has been created following an incredible minimalist style, is shown as a fine horizontal slot made at the front. Its use is both simple and practical, with a wide opening in order to make access easier. 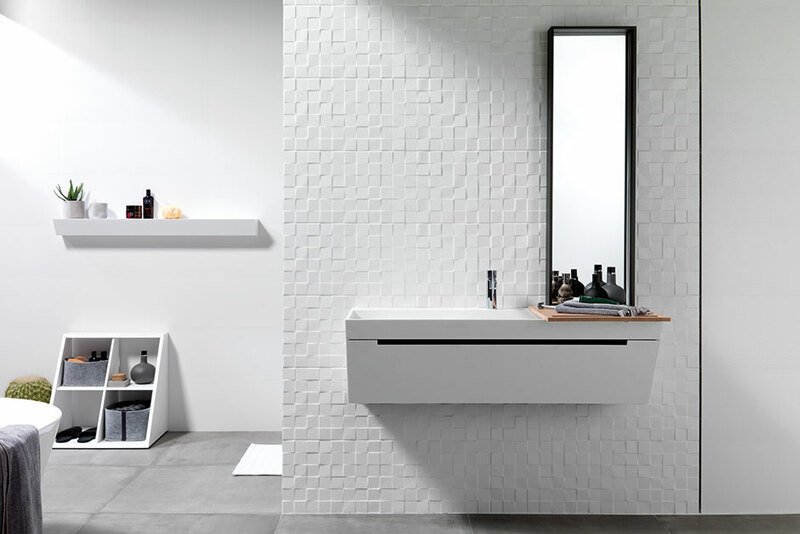 The Bevel vanity’s finish depicts a Nordic-style design, which is very serene and dominated by white, due to its KRION® 1100 Snow White full manufacturing. The new Bevel bathroom collection is completed with other various items including two mirror options, lighting and different sliding shelves. There is also a matching open cabinet with wheels that features the same design as the inward leaning vanity. One can also find a set of wall-hung columns in several sizes with the inward leaning plane, which are facing to one side. Overall, the Bevel collection’s minimalist and geometric design will delight the most daring of spaces.